Description: Emerald-colored jewels and Multi colored granite glass, accent the handsome Amber Beige art glass reproduction of a famous Louis ComfortTiffany design. This Tiffany Roman shade is Inspired by Italian art and architecture and is handcrafted of authentic stained glass by Meyda Tiffany artisans using a copperfoil construction method. 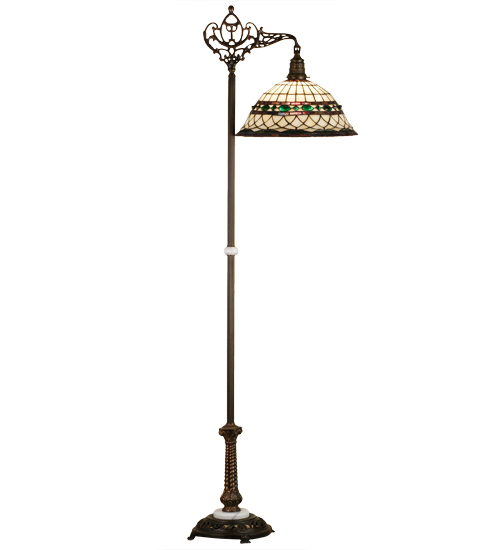 The Bridge Arm Floor Lamp base is finished in a hand applied Mahogany Bronze.